Being a quiet person can have it’s ups and downs, however, there’s just a certain lifestyle that a majority of us would prefer compared to our extroverted opposites. Most of the time, we are misunderstood for the things that we hold dear to us as well as the things that we like to do in our spare time. Of course, it doesn’t necessarily mean that we don’t like doing things that are out of our comfort zone it’s just that we like things to be a certain way before we truly commit. 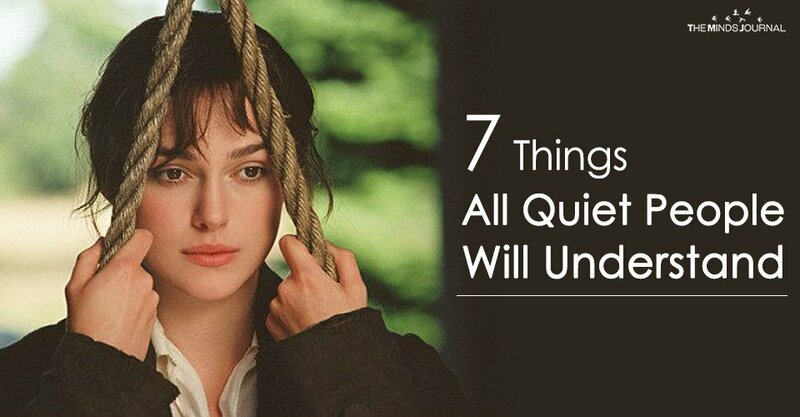 There are a variety of things that we like to do, but these seven things are probably the most relatable to quiet people that stand out the most, or at least to us. Like we said before, we don’t normally do certain things unless there is a purpose behind it. We rarely commit to things that do not involve our personal input simply because we like to give our best to whatever it is that we want to demonstrate to others. It’s important to us that we are able to not get in the way of others as well as being precise with what we do and dealing with the consequences afterward. If we truly think there is no reason for us to be there in the first place then we will most likely not show up. When our friends are too busy or overwhelmed with something going on in their life, we prefer that they take their time instead of rushing to spend time with us. We do not want them to be constantly looking at their watch instead of actually being engaged with what we are talking about or doing together. It’s really no trouble at all if you have other things going on at that moment, just let us know when you think you’ll be done and when you are ready to hang out. We probably have other things we could be doing anyways while we wait for them in the meantime. Not everyone is capable of being our friend so knowing that fact alone should give you a pretty good idea as to what it means for us to be with our close friends. It’s a huge compliment to our friends that we are willing to hang out with them because we know that if it were anyone else we would most likely be an anxious wreck. Not everyone is capable of understanding how we operate so it’s pretty amazing that you’re the kind of person we like to spend our time with. Sure, that may seem like an over-exaggeration, however, it’s more than true when we are out with the people we consider to be our closest friends. One of the best things that every single quiet person is good at is being an observer. This doesn’t mean that we don’t like to not give our input, but more like we look for the right opportunity to speak our minds. i am a quiet person for the most part… but, i can be outgoing and fun.. but. yes. i often think people misunderstand who i am… but. anymore i don’t care.. i don’t justify or apologize….i don’t need to be the center of attention or the loudest one…. but i love to visit with people..